When the link restriction is set (only available to students with the link), the file can only be viewed if they are given the link to the file. However, this option only allows files to be hidden from students in Course Files. This functionality is not valid outside of the Files feature. For instance, if a file with a link restriction is added to a Module or Assignment, the file can always be viewed by students. When the student availability date restriction is set, students can view the name and information for the file. 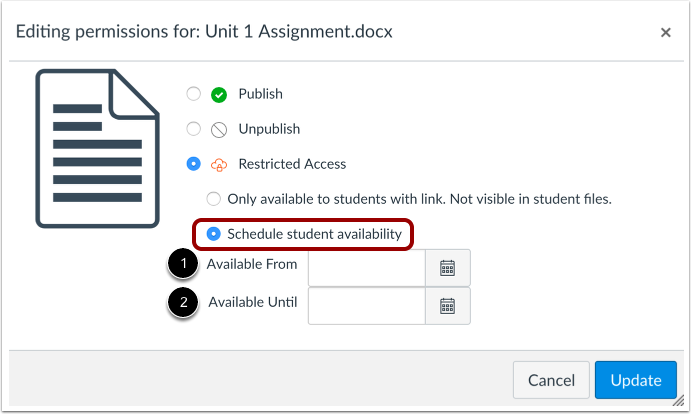 In addition to Course Files, files with an availability date restriction can be viewed anywhere in Canvas (such as when the file is added to Modules or Assignments), but the file will be locked and they cannot view the actual file until the specified date. Note: You can also restrict a file or folder as part of setting usage rights for files or setting usage rights for folders. By default course files are visible and accessible to all users . Teachers and TAs can restrict files and folders , which means the content will only be accessible to teachers and TAs in the course as long as the file is not placed to a content area outside of Files (e.g. Modules, Assignments). To edit a permission, click a file's published or unpublished icon . The default restriction option is to make the file only available to students with the link. The Not visible in student files option makes the file available to students who are given a link to the file. The file will be hidden to students in Course Files. 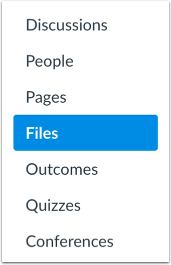 Note: This hidden option only applies to Course Files; if you add this file to another area of Canvas, such as Assignments or Modules, all students can view the file. Schedule student availability gives students a window of time to view the file. 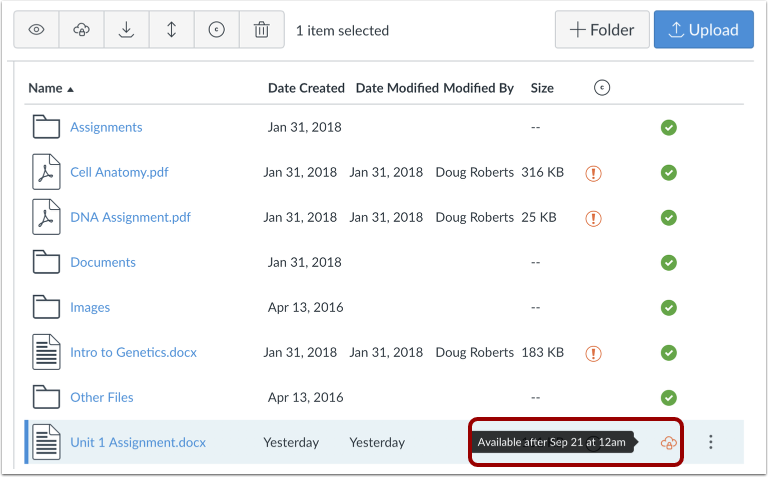 If you select this option, the file can be viewed by students in Course Files as well as anywhere in Canvas (such as when the file is added to Modules or Assignments), but the file will be locked and they cannot view the actual file until the specified date. To set student availability dates, enter the starting date for the file to be available in the Available From field . If applicable, enter the date when students can no longer allow students to view the file in the Available Until field . You can use the calendar to enter a date, or you can enter a date manually. Note that the time field is optional and if not selected it will default to 12am. View the restricted status for the file. Hover over the icon to view the details. Previous Topic:How do I download a folder in ZIP format as an instructor? Next Topic:How do I set usage rights and user access for a course file? Table of Contents > Files > How do I restrict files and folders to students in Canvas? Re: I am locked out of lecture notes?